With recent innovation in the instant espresso industry granting coffee lovers the ability to enjoy coffee shop-quality java from the comfort of their home, there has been one thing noticeably missing: Portability. Specifically, portability in the way that users wouldn’t just be able to simply carry a shot or two of espresso with them but that they would have the option of physically making it on the go. Thankfully, a contraption called Simpresso recently launched on Kickstarter promising to provide a remedy to this problem. Now, with the Simpresso, anyone can whip up a latte, a cappuccino, or Americano wherever and whenever they please. 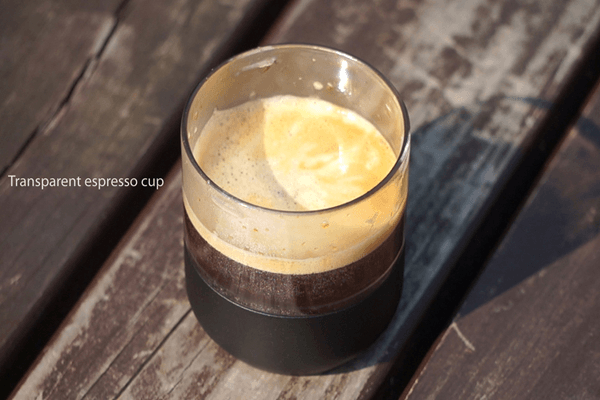 Void of any advanced electronic tech, the Simpresso is comprised solely of a water chamber, an attachable espresso cup, and a lid with a built-in, hand-operated crank which generates pressure to craft the espresso. When using the crank, the device generates pressure from 15 to 19 bars (roughly 217 to 275 PSI) which allow it to continuously produce high-quality espresso. Sized at 8-inches tall and 2.5-inches wide, the Simpresso is no bigger than a traditional portable coffee mug or Thermos. To craft a batch of ported espresso, owners need to simply fill the Simpresso with hot water, pack the reusable capsule with ground coffee of their choice, and then attach the capsule to the bottom of the device. When they are ready to whip up a cup of java, a few cranks of the Simpresso’s handle pumps out a batch into its cup. If all was prepared correctly — and the machine works, of course — then the finished product is none other than a piping hot serving of espresso. For early backers, Simposh offers its Simpresso device for just $42 — though there were only three of these left at the time of writing. After the early backer deal runs out, interested buyers have the option of purchasing a Simpresso for $48, or two for $84. With eight days left in the campaign, Simposh has amassed just shy of $22,000 in funding.